Posted by contrapuntalplatypus in Flights of Fancy, Music, Serendipity, Teaching. Today was one of those days that make any piano teacher rejoice…a day when things “click” for students, not just once but in almost every lesson. One student who, week after week, had done essentially zero work on her pieces (I’d begun to dread her lessons) came in having prepared them so well that I had to stare in amazement. :O Another who announced she’d “forgotten” (??) to work on a song nonetheless sat down and played it perfectly. We went on to try some theory and ear training – new concepts for her, but she caught on quickly and enjoyed them. But the best sort of lessons are the ones where I learn something too…and one of those happened today as well. My beginner student today – let’s call her Jasmine – had just started learning how to read music a week or two ago. Today we were tackling a new piece from the Primer level of Piano Adventures. Now, this is by far the best series of “beginner” books out there on the market: the pieces are fun, unique, and impressive at an early stage. They don’t contain huge distracting or “babyish” illustrations like so many primer-level books. 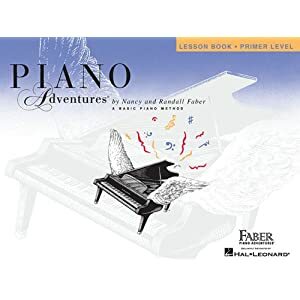 The upper-level pieces (books 2b and on) are, really, masterpieces of “miniature” composition; I’m continually in awe at how the writers (Nancy and Randall Faber) managed to create so much from a few five-finger patterns or chords. However, even the Fabers had, apparently, some trouble making the first 5 notes of C major interesting. And as I played today’s piece (“Fourteen Little Frogs”) for Jasmine, she appeared distinctly underwhelmed. No, this wasn’t going anywhere. And honestly, what self-respecting five-year old would want to learn a song about Fourteen Little Frogs when all the amazing diversity of rock and pop and jazz and country and, yes, classical music was an iPod button push or a YouTube click away? In fact, I had to respect her simply for coming and sitting in front of a piano for half an hour when the rest of her friends were all too audibly laughing and talking in the next room. Jasmine jumped, startled. (Believe me, I was as surprised as she was.) Then her face lit up. Her eyes brightened. “SPLOOSH!” she echoed, banging a similar handful of random notes. All of a sudden she wanted to learn Fourteen Little Frogs. I told her, of course, that she had to play all the notes in the song before she could do the surprise ending. That was fine by her, as long as she was allowed to do the “sploosh” at the end. I’ve never seen someone so eager to learn a beginner song. Even more importantly, though, it keeps the lessons fun for the teacher as well.